• Rejoice always–even in our darkest days there’s something to rejoice about, Jesus’ great gift of salvation and so many other things we often take for granted. • Pray continually–God wants to be invited into all parts of our lives. praying helps us to aline our thoughts and actions with God’s will and plan and gives us strength and hope knowing we’re not, in whatever circumstance it is, alone. • Give thanks IN all circumstances–not necessarily for them. Although, if we try to see through God’s eternal plan we can probably do that, too. I had an email devotion for Greg Laurie based on verse 18 today. It got me thinking. I had just finished having a little cry over not being with our grandkids for their birthdays this month. I do tend to look at my circumstances too much. Really it’s not like I live in a bad place or that I don’t have friends who are dear sisters in Christ right here in St. Louis and in our online Bible study through Proverbs31.org. You’d think we were destitute and homeless the way I throw pity parties, sometimes. But the heart wants what the heart wants and I want to be in So. Cal. with them. And I pout and I eat and get pain in my jaw from clenching it subconsciously. I love it when God does this to me. He gets me writing and then takes me to a place I never expected to go–a place of self examination and His correction. It may sound weird to say I love this, but I strongly desire to be ever closer to the Lord and my mental escapes and pity parties don’t encourage that, so if God says it’s time to start pruning the vine, working the clay, or using the Refiner’s fire to clear out some dross (impurities) from the silver of my soul, so be it. 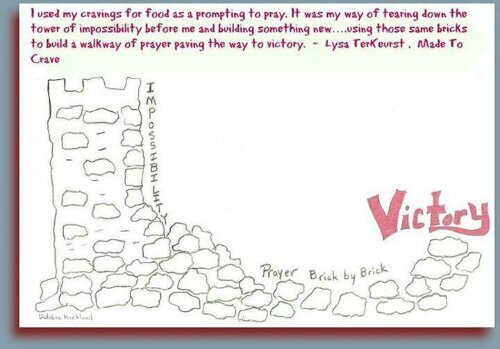 This week we started a new online Bible study (OBS) through proverbs31.org doing Lysa TerKeurst’s book, Made To Crave. It’s about learning to crave God and not food or anything else that distracts us from our relationship with Him. It’s all too easy to let the things of this world crowd God out of our thoughts and lives if we are not intentional in keeping the lines of communication open and purposeful in how we live. I have not had a completely successful week in my weight loss endeavor, not keeping my calorie goal even one day this week and only exercising once. But, I have made positive steps toward meeting those goals. I signed up on sparkpeople.com to use their tracking system. Its been a real eye opener as to the calories I must have been consuming before I started trying to regulate my intake and make better choices. And I have managed to lose a little weight. Yay! I’ve seen a lot of the 42,000+ women doing this study putting themselves down for where they are in their journey or for not being successful in their goals this week. If any of you are reading this blog post please be encouraged. You are working on it and you’re seeking God’s help. Nothing is impossible with God (see Luke 1:37)! He got me off cigarettes 17 years ago this March! Hallelujah!! He can do this too, girls! I often procrastinate on things that challenge me or aren’t pleasant. I wasn’t even sure I was ready for this study when Sunday got here. I did it once before a couple years ago with a church group and it just didn’t sink in. I dare say most of us here have experienced challenges and distractions during this first week, but God shows up and here we are. Just about the end of week one. Headed in the right direction. Letting go of the fails, but learning from them, so they are stepping stones instead of stumbling stones. Did you see the graphic on the Rev It Up Live study last night? If not here it is. I would also encourage you to go through the Rev It Up study on your own if you couldn’t be there live on Facebook last night. It was awesome! Just search in Facebook for Rev It up Live and go for it. So, as this week winds down, let’s take a moment and reflect on the most important thing: God loves us (Colossians 3:12) ! He is with us (Hebrew 13:5)! He is for us, so who can be against us(Romans 8:31)? Will you join me in praying, Heavenly Father, I refuse to stay unchanged. I know I am #Empowered through Your Holy Spirit to do this even more than I can ask or imagine. I will crave You and not __________. You have led me here and You will finish what You have started in me. Nothing is impossible when God is in it. For Your strength is made perfect in my weakness. I am not alone on this journey, for you are with me and 42,000+ women, too. I will thank you in and for the struggles as I go, because it is in the struggles we gain strength, perseverance, and endurance. I will worship You because of Who You are and I will praise You in the storms of life. I will seek your face (presence) continually and not only Your hand (provision). I know You will help me carry on to finish the race well. Thanks and praises as I go into the rest of my day focusing on You. In Jesus’ name, amen. Thank you, Trish. I appreciate the encouragement. Thanks for posting. I feel #Empowered after reading this! God bless you in your journey. Thank you for your vulnerability and honesty in your post. I know that the encouragement that you share here will provide much needed motivation for many. I’m glad I’m taking this journey to craving God instead of food with sisters such as you. Blessings,Mary! Thank you, Mary! Y’all are making me cry.